I'm not going to spend a lot of time on the theory in relation to dietary cholesterol because there really isn't much evidence to debunk in humans. As far as I can tell, most diet-health researchers don't take this theory seriously anymore because the evidence has simply failed to materialize. Dr. Walter Willett doesn't believe it, and even Dr. Ancel Keys didn't believe it. Here's a graph from the Framingham Heart study (via the book Prevention of Coronary Heart Disease, by Dr. Harumi Okuyama et al.) to drive home the point. Eggs are the most concentrated source of cholesterol in the American diet. 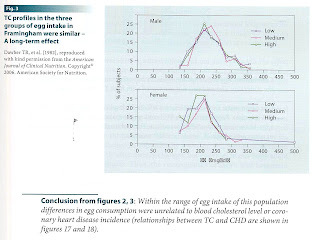 In this graph, the "low" group ate 0-2 eggs per week, the "medium" group ate 3-7, and the "high" group ate 7-14 (click for larger image): The distribution of blood cholesterol levels between the three groups was virtually identical. The study also found no association between egg consumption and heart attack risk. Dietary cholesterol does not raise serum cholesterol in the long term, because humans are adapted to eating cholesterol. We simply adjust our own cholesterol metabolism to compensate when the amount in the diet increases, like dogs. Rabbits don't have that feedback mechanism because their natural diet doesn't include cholesterol, so feeding them dietary cholesterol increases blood cholesterol and causes vascular pathology. The first half of the diet-heart hypothesis states that eating saturated fat raises blood cholesterol. This has been accepted without much challenge by mainstream diet-health authorities for nearly half a century. In 1957, Dr. Ancel Keys proposed a formula (Lancet 2:1959. 1957) to predict changes in total cholesterol based on the amount of saturated and polyunsaturated fat in the diet. This formula, based primarily on short-term trials from the 1950s, stated that saturated fat is the primary dietary influence on blood cholesterol. According to Keys' interpretation of the trials, saturated fat raised, and to a lesser extent polyunsaturated fat lowered, blood cholesterol. But there were serious flaws in the data from the very beginning, which were pointed out in this searing 1973 literature review in the American Journal of Clinical Nutrition (free full text). The main problem is that the controlled trials typically compared saturated fats to omega-6 linoleic acid (LA)-rich vegetable oils, and when serum cholesterol was higher in the saturated fat group, this was most often attributed to the saturated fat raising blood cholesterol rather than the LA lowering it. When a diet high in saturated fat was compared to the basal diet without changing LA, often no significant increase in blood cholesterol was observed. Studies claiming to show a cholesterol-raising effect of saturated fat often introduced it after an induction period rich in LA. Thus, the effect may have more to do with LA lowering blood cholesterol than saturated fat raising it. This is not at all what I was expecting to find when I began looking through the short-term trials. The most important finding of this study was that lowering total saturated fat in the form of coconut oil, from 22.7 to 10.5 E% without change in the P/S ratio [polyunsaturated to saturated ratio], did not lower total or LDL cholesterol, but significantly reduced HDL cholesterol. I don't claim that this one study settles the question, but does illustrate that saturated fat does not have a large and consistently detectable effect on total or LDL cholesterol. Among the many other studies I examined, I found an apparently well-controlled counterexample: Arterioscler. Thromb. Vasc. Biol. 18:441. 1988. In this 8-week study, increasing saturated fat (at the expense of carbohydrate and with LA constant) increased total cholesterol and LDL, while also increasing HDL, and decreasing Lp(a) and triglycerides (the latter three changes are thought to be protective). Decreasing saturated fat from 15% to 6% of calories (drastic), reduced total cholesterol by 9% and LDL by 11% (calculated by the Friedewald equation). The variation between trials may have to do with the specific saturated fatty acids used in each trial, their duration, or some other unknown confounder. Reading through the short-term controlled trials, I was struck by the variability and lack of agreement between them. Some of this was probably due to a lack of control over variables and non-optimal study design. But if saturated fat has a dominant effect on serum cholesterol in the short term, it should be readily and consistently demonstrable. It clearly is not. The long-term data are also not kind to the diet-heart hypothesis. Reducing saturated fat while greatly increasing LA certainly does lower blood cholesterol substantially. This was the finding in the well-controlled Minnesota Coronary Survey trial, for example (14% reduction). But in other cases where LA intake changed less, such as MRFIT, the Women's Health Initiative Diet Modification trial and the Lyon Diet-Heart trial, reducing saturated fat intake had little or no effect on total cholesterol or LDL (0-3% reduction). This generally dumbfounded the investigators. The small changes that did occur could easily have been due to other factors, such as increased fiber and phytosterols, since these were multiple-factor interventions. Another blow to the idea that saturated fat raises cholesterol in the long term comes from observational studies. Here's a graph of data from the Health Professionals Follow-up study, which followed 43,757 health professionals for 6 years (via the book Prevention of Coronary Heart Disease by Dr. Harumi Okuyama et al. ): What this graph shows is that at a relatively constant LA intake, neither saturated fat intake nor the ratio of LA to saturated fat were related to blood cholesterol in freely living subjects. This was true across a wide range of saturated fat intakes (7-15%). If we can't even find a consistent association between dietary saturated fat and blood cholesterol in observational studies, how can we claim that saturated fat is a dominant influence on blood cholesterol? There's more. If saturated fat were important in determining the amount of blood cholesterol in the long term, you'd expect populations who eat the most saturated fat to have high blood cholesterol levels. But that's not at all the case. The Masai traditionally get almost 2/3 of their calories from milk fat, half of which is saturated. In 1964, Dr. George V. Mann published a paper showing that traditional Masai warriors eating nothing but very fatty milk, blood and meat had an average cholesterol of 115 mg/dL in the 20-24 year age group. For comparison, he published values for American men in the same age range: 198 mg/dL (J. Atherosclerosis Res. 4:289. 1964). Apparently, eating three times the saturated animal fat and several times the cholesterol of the average American wasn't enough to elevate their blood cholesterol. What does elevate the cholesterol of a Masai man? Junk food. I have to conclude that if saturated fat influences total cholesterol or LDL concentration at all, the effect is modest and is secondary to other factors.